THE GOOD - Toni Collette gives the best performance of her career. The film is unspeakably horrific. Supporting performances are all stellar. THE BAD - Some will say it is too slow. Others will say the third act is too "out there." “Hereditary” marks the directorial debut of Ari Aster and it not only joins the ranks with,” “Night Of The Living Dead,” “The Texas Chainsaw Massacre” "The Babadook" and “The Witch” as a directorial debut horror classic, it also joins “The Exorcist” as one of the best horror films you are likely to ever see for sheer visceral power, emotion, and genuinely frightening scares. This is horror done correctly. This is the kind of horror that disturbs, provokes and causes you to not sleep for days. A24 has done an incredible job in their marketing of the film, hiding the true nature of the film from unsuspecting viewers who I imagine will be shocked and horrified by what they see on screen. 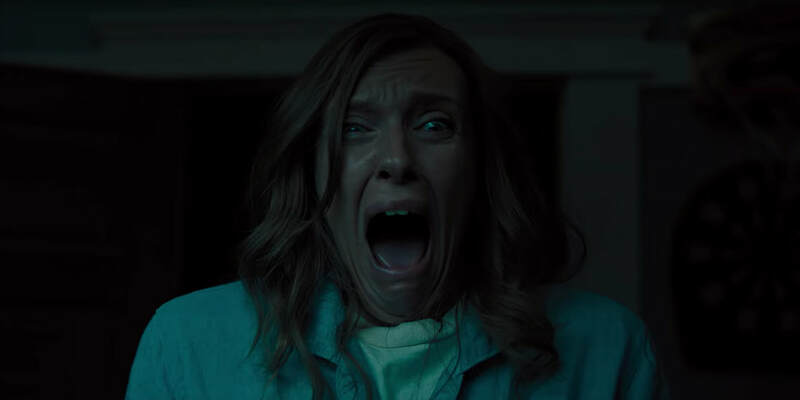 One thing that A24 has not misled us with though is how tremendous Toni Collette is in the role of the matriarchal mother whose life spins out of control in the wake of her mother’s death. Annie (Toni Collette) lives with her husband Steve (Gabriel Byrne) and their two children Peter (Alex Wolff) and Charlie (Milly Shapiro) in a secluded house in the woods where she works as a miniature artist. When Annie’s mother dies, she is forced to confront the kind of person her mother was: a reclusive and spiritual woman who may have been hiding dark secrets from her family for decades. Those secrets start to reveal themselves and slowly the repercussions of which, start to unravel Annie and her family. A grieving Annie seeks help from a kind woman at a grief support group (Ann Dowd) who offers her an opportunity to communicate with the deceased, thus bringing further pain to her family. Toni Collette. Toni Collette. Toni Collette. I cannot say it enough. Not since Ellen Burstyn in 1973's “The Exorcist” has there been a leading actress performance this strong in a horror movie (That’s right, I’d rank her above Essie Davis in “The Babadook”). She is a raw time bomb of emotion, fury, confusion and sheer terror. She carries us through the entire movie with her ever-shifting performance in one of the best displays of grief, pain, and anxiety on screen that I can recall. Hopefully, the Academy recognizes what a tremendous performance this truly is and bestows her with her second Oscar nomination (Her first, was for another horror classic “The Sixth Sense”) for her work in this movie because she honestly deserves it. Without her performance, “Hereditary” would still be a solid horror film but because of her, its elevated to near masterpiece level. While her performance is certainly Oscar-worthy, she is not alone in delivering exactly what the movie needs. The rest of the ensemble is up to the daunting task of having to share the screen with Toni Collette’s masterwork. Gabriel Byrne’s weary eyes and withered soul convey internalized torment. Alex Wolff delivers a breakout performance that will surely catapult him to more roles in Hollywood. Other than Collette, his is probably the most demanding challenge of all and he more than rises up to it. Milly Shapiro is as expected, creepy yet sympathetic and how could you ever go wrong with having Ann Down in your movie? Needless to say, this may be the Toni Collette showcase for what is undoubtedly the best performance of her career but she is supported by an equally committed ensemble of great actors. There are some who will take issue with “Hereditary’s” methodical pacing. I can already hear the waves of casual viewers telling their friends and family that the film was too slow for them to get fully invested. Hopefully, one major twist will have them re-adjusting themselves in their seats and paying attention to what kind of story Aster is trying to tell here. And if that doesn’t grab their attention, then surely the third act’s full-blown horror theatrics will. Though, on the other side of that, there are some who will probably find the third act overdone with the supernatural elements and misaligned with the grounded tone of the first two acts. It is my belief that the third act is properly built up to and culminates in a nightmarish sequence that is frighteningly effective and keeping in with the themes of the film. To go into a bit more detail as to why the decisions that Aster made with the film ultimately work, it all comes back to Toni Collette. The reason why Collette’s performance is so essential to the movie’s success is because of how much her pain is relatable to us. Her performance strikes all of the right notes for the maximum amount of empathy from the viewer. “Hereditary” may be a supernatural movie at times but for its first two acts, its a commentary on death, grief, misery, and fear. The best kind of horror films are the ones which reflect our own fears. “Hereditary” examines the fear of “something” being passed down from your parents onto you. Whether its mental illness, disease or bad traits in general, it is a parent’s greatest fear: not being in control of protecting their children. It’s because of this universal fear that “Hereditary” acquires the hook it needs, and plunges it deep within our hearts and our souls, sucking the life-force out of us until there is nothing left. Don’t believe me? By the time the film reached its masterful, haunting conclusion, l left the theater barely able to walk and unable to speak. My hands were sweaty and shaky. I knew that what I had just seen deeply disturbed me, right down to my core. This isn’t so much your typical jump-scare horror movie. This is forbidden horror. The kind of which you wouldn’t even want to bring up in conversation with your friends. Director/Writer Ari Aster has earned my admiration and praise for properly being able to convey all of these emotions in a succinct and thoughtful manner which will hopefully allow “Hereditary” to be passed on from generation to generation and survive as a new horror classic. Beware though…for some, this will be a traumatizing experience. You have been advised.